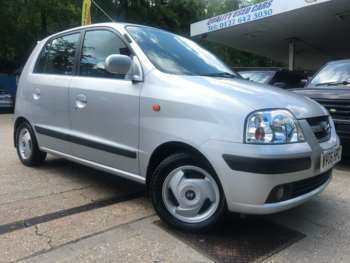 1.1 ATLANTIC 5dr 1 OWNER WITH FSH. 1.1 GSI 5DR From £1750+Retail package. Hyundai's Amica is in essence a repackaged version of its unpopular Atoz. The rather lacklustre sales pitch worked, however, as the Amica gently gained momentum on its predecessor. Hyundai aimed the Amica squarely at the city car market, encouraging first-time buyers or families looking for an auxiliary car. Points in its favour are an unintimidating appearance, simple controls and compact size for easy parking and zipping through traffic. Lukewarm styling aside, a multi-valve engine gives the used Hyundai Amica one-up on its rivals. A significant revision was a replacement of the three-speed automatic gearbox with a four-speed equivalent. A 2006 version of the second hand Hyundai Amica included a restyled front end, better amenities and a 1.1 litre engine, although on the inside not much had changed. A teeny, tiny 1.0 litre engine in a five-door vehicle doesn't make for a muscle car. It is shorter and narrower than its miniature rivals, the Ford Ka, Seat Aroso and VW Lupo, but you can't tell from the roomy-feeling inside. Five doors are helpful for easy access and don't detract from a relatively sleek bodyshell. In fact for an unsophisticated car, the used Hyundai Amica has quite a lot to offer. Trim levels are Si and GSi, which boasts funky alloy wheels. A well-engineered 1.0 litre 'Epsilon' engine gives you the choice of five-speed manual, five-speed semi-automatic and three or four-speed automatic transmissions. The cabin was originally very smart but does look a bit dated on later editions, but is pleasantly spacious, indeed a 'What Car?' ergonomics report rated the Amica very highly on comfort. There are some thoughtful elements included, such as semi-reclining front seats, useful on longer trips, sliding under-seat storage, integrated cup holders and useful map pockets in the door cards. 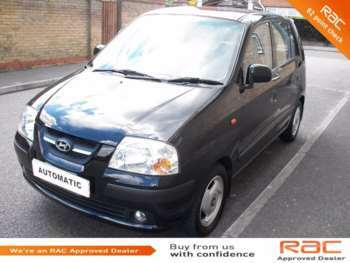 Unfortunately the Hyundai Amica for sale must be marked down one point for the lack of ABS as standard (it is an option). Possibly working on the notion that you'll never get up enough speed to need it, it doesn't take that much wet to lose grip and the common use of ABS in other cars could lead to a bit of driver complacency that may be dangerous here. Rare motorway usage keeps mileage low but in true city car style the Amica does tend to work hard in the clutch and lower gears through urban traffic, so examine mechanicals carefully. However its little engine is a winner, with no faults reported. Focus more on driver damage, such as kerbing or parking scrapes and look for decent tyres. The interior may have suffered some child abuse so you could haggle on scruffy trim, but more important is a full service history. 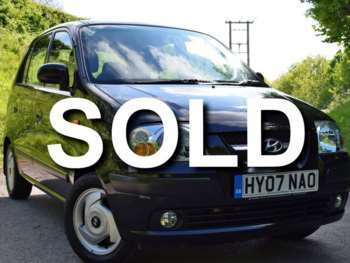 The used Hyundai Amica is aimed at the economy market and replacement parts follow suit. An exhaust minus catalyst is £210, or another £400 complete with catalyst. New headlights cost £90 each, a clutch assembly kit £130, an alternator about £170 and a starter motor about £150. A pair of brake pads will cost you £60 for the front and £70-ish for the rear. 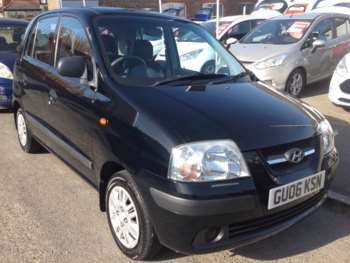 Hyundai Amica cars for sale go pretty well on its ostensibly meagre 55bhp. The tiny, 1.0 litre engine is very giving and quite sparky, but scores higher for effort than attainment, sadly lacking refinement. It won't hug the corners like an F1 car but ride and handling are good for this style of car. You won't want to take the Amica off-roading and the motorway needs everything your right foot can give it but it'll zip through the traffic quite happily. Despite its admirable attitude, the engine is disappointingly thirsty and unless you've been lucky enough to find an ABS equipped model you will have to take care in the wet. A sensible buyer will be aware of all this and able to appreciate what a used Amica has to offer, which is reliability, practicality and great value for money. Got a specific Hyundai Amica model in mind?